Emotions can be divided into at least three major domains: emotional experiences, emotional memories, and emotional behaviors. 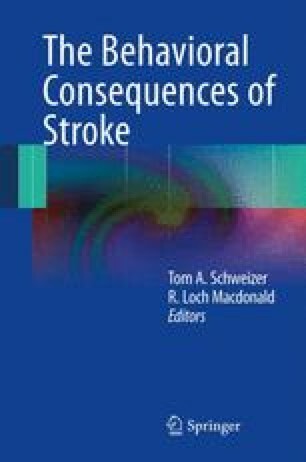 Stroke can induce changes in all three of these domains; however, in this chapter we will focus on emotional behaviors and primarily review the disorders of emotional communication that can be induced by stroke. There are several means by which emotions can be classified or categorized, including valence (positive, neutral, negative), arousal (high, moderate, low), and activity (approach, avoid, none) . For example, fear would be an emotion characterized by negative valence, high arousal, and avoidance. Ross et al. also divides emotions into primary (e.g., happy, sad, anger, fear) and social (e.g., embarrassed) categories. In this chapter, deficits of emotional communication will mainly address the primary emotions, which include happiness, sadness, anger, fear, disgust, surprise, and neutrality.